Dimensions Festival heads to Oval Space on 14th April, inviting a selection of legendary electronic artists of the past, present and future for the London leg of their Launch Party Series. Legowelt headlines on 14th April with one of his inimitable live shows, off the back of yet another critically acclaimed album, Legendary Freaks In The Trash Of Time. 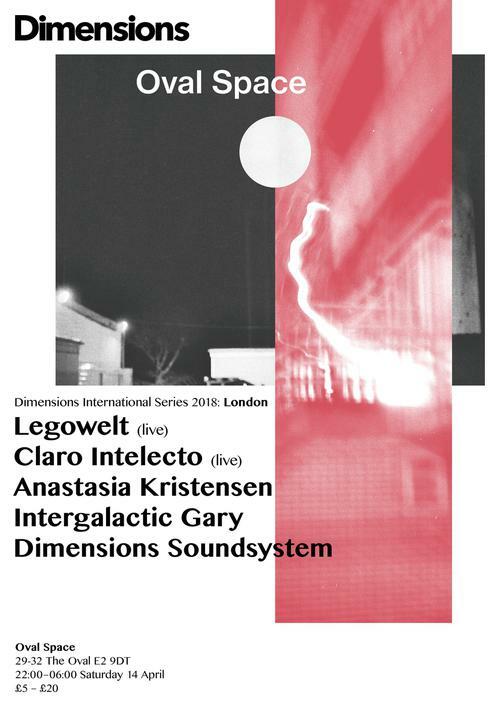 His discography, featuring releases on iconic labels such as Clone, L.I.E.S., Creme Organization and Dekmantel, attest to a prolific and varied output that have made Legowelt a unique presence in modern dance music. He's joined by Mancunion techno and electro royalty Claro Intelecto, in what will be his first London live show for over four years. Claro will be performing classic tracks and cuts from his new album Exhilarator - definitely one of our top LP picks of 2017. Meanwhile Intergalactic Gary, a bonafide party-starter who delivered one of our standout sets in Fort Punta Cristo last summer, alongside perennial tastemakers and the minds and record bags behind the festival, Dimensions Soundsystem.